Designer cufflinks for men are a great way to express your style and personality. From stylish etched sterling silver cufflinks, to humorous bone china cufflinks, we are sure to have what you are looking for. We sell only the best quality cufflinks from some of England's leading designers. Cuff links are worn by men to fasten the two sides of a cuff together on shirts that have button holes but no buttons. Tyler and Tyler Brown Spring Cufflinks. These high quality cufflinks are part of the unique Tyler & Tyler collection of die-struck hand-enamelled cufflinks. Silver finish with enamel. Supplied in a gift box. Tyler and Tyler Burgundy Spring Cufflinks. These high quality cufflinks are part of the unique Tyler & Tyler collection of die-struck hand-enamelled cufflinks. Silver finish with enamel. Supplied in a gift box. Tyler and Tyler Navy Spring Cufflinks. These high quality cufflinks are part of the unique Tyler & Tyler collection of die-struck hand-enamelled cufflinks. Silver finish with enamel. Supplied in a gift box. Tyler and Tyler Green Jazz Cufflinks. These high quality cufflinks are from the Victorian Wallpaper range. Part of the unique Tyler & Tyler collection of die-struck hand-enamelled cufflinks. Supplied in a gift box. Tyler and Tyler Navy Jazz Cufflinks. These high quality cufflinks are from the Victorian Wallpaper range. Part of the unique Tyler & Tyler collection of die-struck hand-enamelled cufflinks. Supplied in a gift box. Tyler and Tyler White Jazz Cufflinks. These high quality cufflinks are from the Victorian Wallpaper range. Part of the unique Tyler & Tyler collection of die-struck hand-enamelled cufflinks. Supplied in a gift box. Tyler and Tyler Green Diffusion Cufflinks. These high quality cufflinks are part of the unique Tyler & Tyler collection of die-struck hand-enamelled cufflinks. Silver finish with enamel. Supplied in a gift box. Tyler and Tyler Purple Diffusion Cufflinks. These high quality cufflinks are part of the unique Tyler & Tyler collection of die-struck hand-enamelled cufflinks. Silver finish with enamel. Supplied in a gift box. Tyler and Tyler White Diffusion Cufflinks. These high quality cufflinks are part of the unique Tyler & Tyler collection of die-struck hand-enamelled cufflinks. Silver finish with enamel. Supplied in a gift box. Tyler and Tyler Brown Disco Cufflinks. These high quality cufflinks are part of the unique Tyler & Tyler collection of die-struck hand-enamelled cufflinks. Silver finish with enamel. Supplied in a gift box. Tyler and Tyler Purple Disco Cufflinks. These high quality cufflinks are part of the unique Tyler & Tyler collection of die-struck hand-enamelled cufflinks. Silver finish with enamel. Supplied in a gift box. Tyler and Tyler Blue Zig Zag Cufflinks. These high quality cufflinks are part of the unique Tyler & Tyler collection of die-struck hand-enamelled cufflinks. Silver finish with enamel. Supplied in a gift box. Tyler and Tyler Green Zig Zag Cufflinks. These high quality cufflinks are part of the unique Tyler & Tyler collection of die-struck hand-enamelled cufflinks. Silver finish with enamel. Supplied in a gift box. Tyler and Tyler Purple Zig Zag Cufflinks. These high quality cufflinks are part of the unique Tyler & Tyler collection of die-struck hand-enamelled cufflinks. Silver finish with enamel. Supplied in a gift box. Tyler and Tyler Red Zig Zag Cufflinks. These high quality cufflinks are part of the unique Tyler & Tyler collection of die-struck hand-enamelled cufflinks. Silver finish with enamel. Supplied in a gift box. Tyler and Tyler Purple Satelite Cufflinks. These high quality cufflinks are part of the unique Tyler & Tyler collection of die-struck hand-enamelled cufflinks. Silver finish with enamel. Supplied in a gift box. Tyler and Tyler Red Satelite Cufflinks. These high quality cufflinks are part of the unique Tyler & Tyler collection of die-struck hand-enamelled cufflinks. Silver finish with enamel. Supplied in a gift box. Tyler and Tyler Navy Rose Cufflinks. These high quality cufflinks are part of the unique Tyler & Tyler collection of die-struck hand-enamelled cufflinks. Silver finish with enamel. Supplied in a gift box. Tyler and Tyler Pink Rose Cufflinks. These high quality cufflinks are part of the unique Tyler & Tyler collection of die-struck hand-enamelled cufflinks. Silver finish with enamel. Supplied in a gift box. Tyler and Tyler Red Rose Cufflinks. These high quality cufflinks are part of the unique Tyler & Tyler collection of die-struck hand-enamelled cufflinks. Silver finish with enamel. Supplied in a gift box. Tyler and Tyler Black Vine Cufflinks. These high quality cufflinks are part of the unique Tyler & Tyler collection of die-struck hand-enamelled cufflinks. Silver finish with enamel. Supplied in a gift box. Tyler and Tyler Brown Vine Cufflinks. These high quality cufflinks are part of the unique Tyler & Tyler collection of die-struck hand-enamelled cufflinks. Silver finish with enamel. Supplied in a gift box. Tyler and Tyler Red Vine Cufflinks. These high quality cufflinks are part of the unique Tyler & Tyler collection of die-struck hand-enamelled cufflinks. Silver finish with enamel. Supplied in a gift box. Tyler and Tyler Bright Blue Metal Spring Cufflinks. These high quality cufflinks are part of the unique Tyler & Tyler collection of die-struck hand-enamelled cufflinks. Silver finish with enamel. Supplied in a gift box. Tyler and Tyler Bright Pink Metal Spring Cufflinks. These high quality cufflinks are part of the unique Tyler & Tyler collection of die-struck hand-enamelled cufflinks. Silver finish with enamel. Supplied in a gift box. Tyler and Tyler Pink Metal Spring Cufflinks. These high quality cufflinks are part of the unique Tyler & Tyler collection of die-struck hand-enamelled cufflinks. Silver finish with enamel. Supplied in a gift box. Tyler and Tyler Purple Metal Spring Cufflinks. These high quality cufflinks are part of the unique Tyler & Tyler collection of die-struck hand-enamelled cufflinks. Silver finish with enamel. Supplied in a gift box. Tyler and Tyler Bright Blue Metal Vine Cufflinks. These high quality cufflinks are part of the unique Tyler & Tyler collection of die-struck hand-enamelled cufflinks. Silver finish with enamel. Supplied in a gift box. Tyler and Tyler Green Metal Vine Cufflinks. These high quality cufflinks are part of the unique Tyler & Tyler collection of die-struck hand-enamelled cufflinks. Silver finish with enamel. Supplied in a gift box. Tyler and Tyler Purple Metal Vine Cufflinks. These high quality cufflinks are part of the unique Tyler & Tyler collection of die-struck hand-enamelled cufflinks. Silver finish with enamel. Supplied in a gift box. Tyler and Tyler Fifi Cufflinks. These high quality cufflinks are from the Victorian Tease range. Part of the unique Tyler & Tyler collection of die-struck hand-enamelled cufflinks. Supplied in a gift box. Tyler and Tyler Legs Cufflinks. These high quality cufflinks are from the Victorian Tease range. Part of the unique Tyler & Tyler collection of die-struck hand-enamelled cufflinks. Supplied in a gift box. Tyler and Tyler Roxy Cufflinks. These high quality cufflinks are from the Victorian Tease range. Part of the unique Tyler & Tyler collection of die-struck hand-enamelled cufflinks. Supplied in a gift box. Tyler and Tyler Ritzy Cufflinks. These high quality cufflinks are from the Victorian Tease range. Part of the unique Tyler & Tyler collection of die-struck hand-enamelled cufflinks. Supplied in a gift box. Tyler and Tyler Eagle - White Brick Cufflinks. These high quality cufflinks are from the Stencilart range. Part of the unique Tyler & Tyler collection of die-struck hand-enamelled cufflinks. Supplied in a gift box. Tyler and Tyler Cheeky Chimp - Glitter Cufflinks. These high quality cufflinks are from the Stencilart range. Part of the unique Tyler & Tyler collection of die-struck hand-enamelled cufflinks. Supplied in a gift box. Tyler and Tyler Charlie Chimp - White Brick Cufflinks. These high quality cufflinks are from the Stencilart range. Part of the unique Tyler & Tyler collection of die-struck hand-enamelled cufflinks. Supplied in a gift box. Tyler and Tyler Hot lips - White Brick Cufflinks. These high quality cufflinks are from the Stencilart range. Part of the unique Tyler & Tyler collection of die-struck hand-enamelled cufflinks. Supplied in a gift box. Tyler and Tyler Stick Em Up - Red Brick Cufflinks. These high quality cufflinks are from the Stencilart range. Part of the unique Tyler & Tyler collection of die-struck hand-enamelled cufflinks. Supplied in a gift box. Tyler and Tyler Barry Bulldog - Glitter Cufflinks. These high quality cufflinks are from the Stencilart range. Part of the unique Tyler & Tyler collection of die-struck hand-enamelled cufflinks. Supplied in a gift box. Tyler and Tyler Doh - Red Brick Cufflinks. These high quality cufflinks are from the Stencilart range. Part of the unique Tyler & Tyler collection of die-struck hand-enamelled cufflinks. Supplied in a gift box. Tyler and Tyler Black Franklin Cufflinks. These high quality cufflinks are from the Victorian Wallpaper range. Part of the unique Tyler & Tyler collection of die-struck hand-enamelled cufflinks. Supplied in a gift box. Tyler and Tyler Bright Pink Franklin Cufflinks. These high quality cufflinks are from the Victorian Wallpaper range. Part of the unique Tyler & Tyler collection of die-struck hand-enamelled cufflinks. Supplied in a gift box. 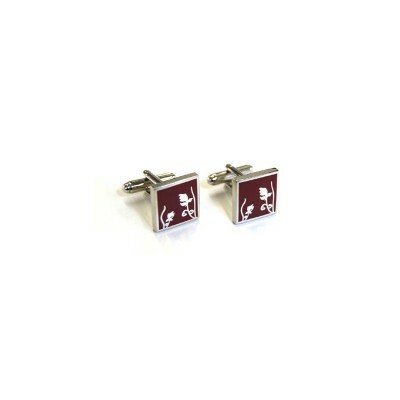 Tyler and Tyler Burgundy Franklin Cufflinks. These high quality cufflinks are from the Victorian Wallpaper range. Part of the unique Tyler & Tyler collection of die-struck hand-enamelled cufflinks. Supplied in a gift box. Tyler and Tyler Red Franklin Cufflinks. These high quality cufflinks are from the Victorian Wallpaper range. Part of the unique Tyler & Tyler collection of die-struck hand-enamelled cufflinks. Supplied in a gift box. Tyler and Tyler Black Clarence Cufflinks. These high quality cufflinks are from the Victorian Wallpaper range. Part of the unique Tyler & Tyler collection of die-struck hand-enamelled cufflinks. Supplied in a gift box. Tyler and Tyler Bright Pink Clarence Cufflinks. These high quality cufflinks are from the Victorian Wallpaper range. Part of the unique Tyler & Tyler collection of die-struck hand-enamelled cufflinks. Supplied in a gift box.